If you read last week’s post How to Christmas Shop with a Budget you saw the suggestion of making gifts for your family and friends. Today we have 12 homemade Christmas gift ideas to help fill stockings and warm hearts. Calendar – Christmas is a great occasion to give your loved ones new calendars to plan the new year. If you have a little computer or crafting skills you can put together a gift that keeps giving all year long. Ornaments – Homemade ornaments can personalize the holiday and make your tree special. Find ideas here, here, and here. Scarves – As I said in this post, my sister crocheted a scarf for me that I wear every winter. If you’re a beginner, try reading this how to article. Don’t forget that a friend or family member might be happy to teach you, my Grandma taught me how to crochet. Baked Goods – Everyone loves baked goods! Try these cookies or this banana bread. If you’re skilled in the kitchen be sure to put these skills to good use. Wreaths – A wreath welcomes family and friends to your home and they’re pretty easy to make. Follow my tutorial here. Photo Album / Scrapbook – Organize photos and souvenirs from vacations, weddings, trips, and memories in a photo album or scrapbook. Put Together A Video – Your computer may come with a simple movie editing system like iMovie. With some time and thought, you can put together videos of school plays, baseball or softball games, add a bit of music and you have a gift to watch over and over. 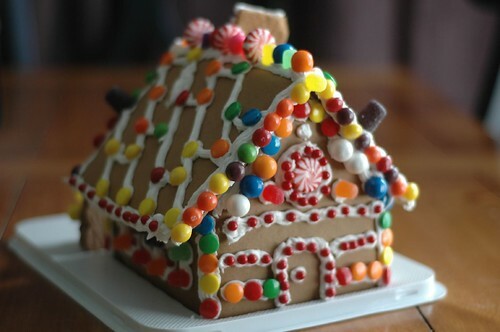 Build a Gingerbread House – This is a great idea to do with kids, not only can you decorate the house with fun candy you can eat it too! For more ideas check out this site. Candles – These teacup candles are adorable! Gift Basket – Put together a themed gift basket. For example, put together popcorn, candy, and a movie or Netflix subscription. If you’re looking to save money on buying a DVD, write a coupon for a TV movie night. 🙂 Try making baskets with tea or coffee or make a basket full of lotions, body scrubs, and bubble baths, use your imagination! Etch Glass – Shop at a thrift store and etch designs or monograms in the glass for a new and personalized look! Fill the jars with candy or treats. Body Scrub – Every girl likes to have soft skin! A jar of body scrub can be expensive. Make your own body scrub with salt or sugar. Find recipes here and here. Re-purpose an old jar and put in a gift basket. Bonus points for etching the jar! Are you done shopping or are you planning on making gifts? What are your go to homemade gift ideas?